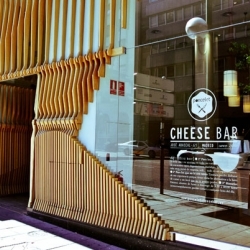 The main concept in the Poncelet Cheese Gastro-Bar in Madrid, Spain. 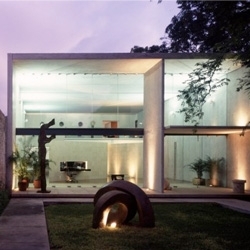 is based on the care of nature, and the use of materials and products that respect it. 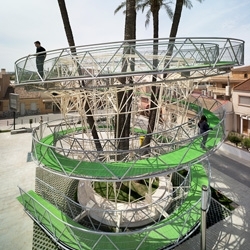 El Mirador del Palmeral designed by Joaquin Alvado Bañon in Spain, serves both as a spiraling walkway/lookout tower and a brace for the palm trees. 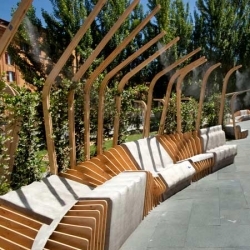 UNIRE/UNITE: Urban Movement Design in the MAXXI piazza | The installation by the Italian-American office, winner of YAP MAXXI 2012, transformes the Zaha Hadid’s Museum plaza into a space for summer live events. 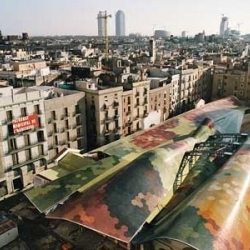 Fundacio Enric Miralles | In Barcelona, a space dedicated to the experimentation of contemporary architecture in memory of the Catalan architect opens June 21. 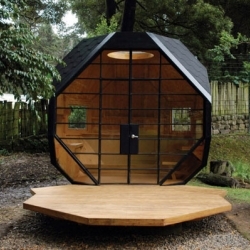 The "Habitable Polyhedron" is a geometric shed tucked away in a garden several yards away from the client's main house that offers a cozy retreat where the family can relax. 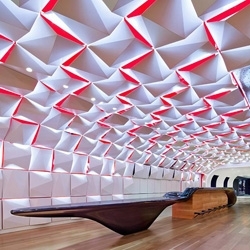 The new Salon Urbain lounge and event space in Montreal, designed by Sid Lee Architecture and Ædifica, features a bar in the shape of a soundwave. 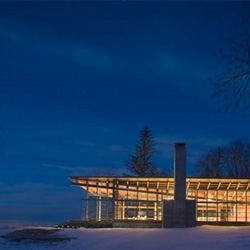 Combs Point Residence in Finger Lakes, New York by Bohlin Cywinski Jackson. 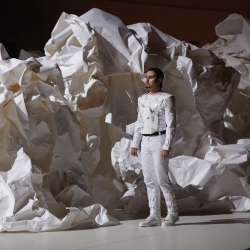 Frank Gehry designs sets for LA Philharmonic's Don Giovanni. 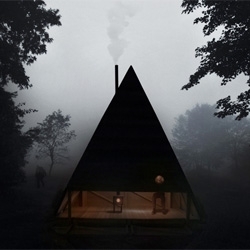 Black Lodge by Jägnefält Milton on a remote Swedish island. 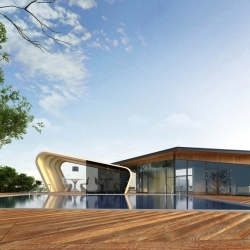 This pool house is actually part of a new wave of inflatable structures! 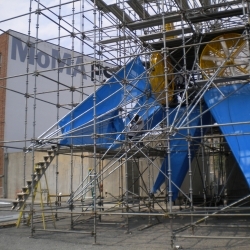 The frame of the structure has inflatable panels attached - and can last for years. 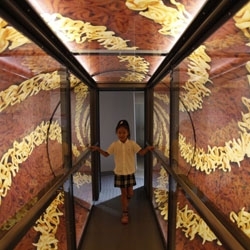 The interactive Cupnoodles Museum in Yokohama, Japan, covers the history of the instant ramen and offers up a lot of fun. 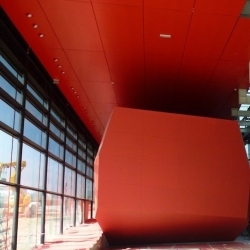 Frac Bretagne by Odile Decq. 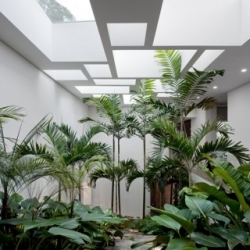 Brazilian architect Isay Weinfeld has mastered the marriage of nature and architecture in the Casa Grecia, where an Eco-system of 1,900 square meters of plants exist within the Sao Paulo home. 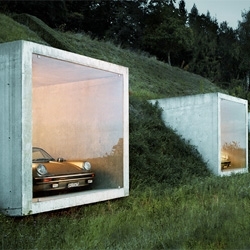 Gorgeous garage (Garagenatelier) in Herden, Switzerland embedded into the landscape by Peter Kunz Architektur. 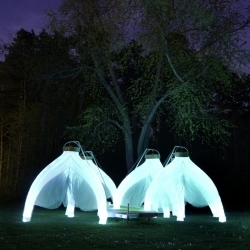 Fantastic Trailer is a mobile pavilion constructed out of glowing inflatable 'draft columns'. From Cheryl Baxter. 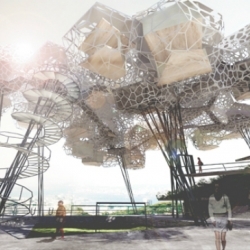 'Meteors' projects by Frédéric Ruyant for Gardens Garden. 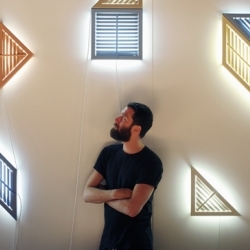 'Daylight' series by Philippe Malouin features slats lined in LED lights giving the illusion of sunlight streaming through shutters. A real ‘Evergreen‘ never vanishes... 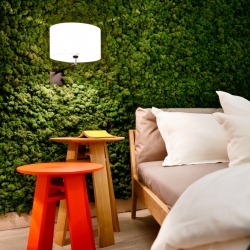 The panel is moss-covered and fuses a pleasing natural appearance with functionality. 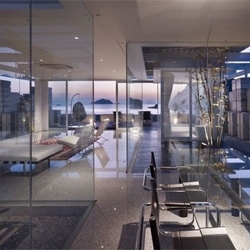 Glass House in Hiroshima by NAF Architect & Design. 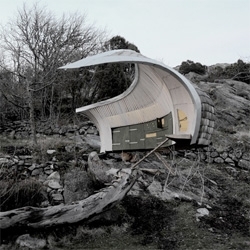 'Villa Ladybird' by Johan Sundberg Arkitektur in Beddingestrand, Sweden. 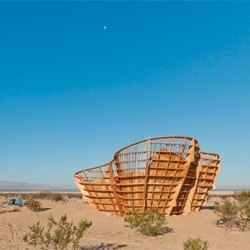 Yucca Crater, a temporary space in California’s Mojave Desert designed by Ball-Nogues Studio for High Desert Test Sites. 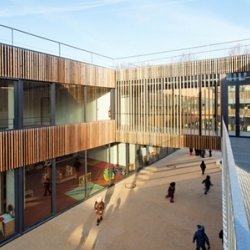 Groupe scolaire Lucie Aubrac by Dietmar Feichtinger Architectes. A public institution with a strong identity. 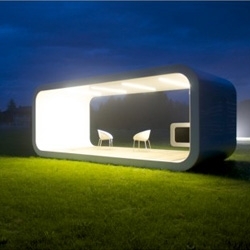 Beautiful prefab modules from Moodo. 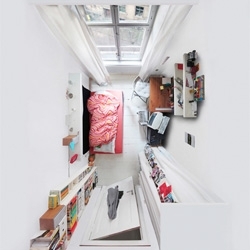 Menno Aden's beautiful room portraits capture spaces from unique perspectives. 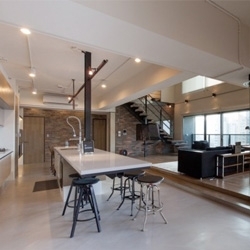 PMK+Designers' Lai Residence in Kaohsiung City, Taiwan. 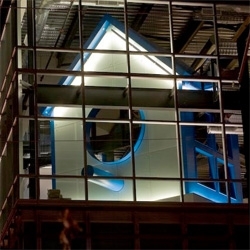 A fun look around the HomeAway World Headquarters located in downtown Austin, TX. 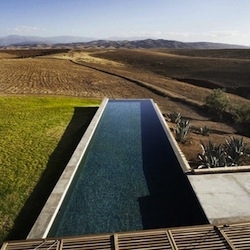 The Villa K pool in Tagadert, Morocco, designed by Studio KO. 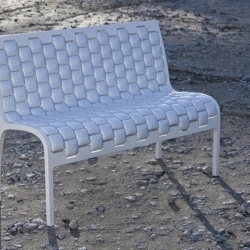 'Onda' outside ceramic furniture by Marc Aurel. 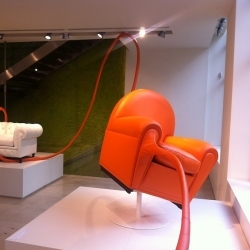 Poltrona Frau, showroom scenography by Noé Duchaufour-Lawranse. 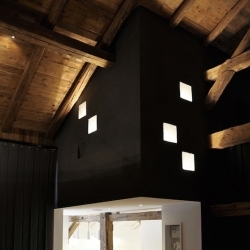 A pro skateboarder revamps a decaying hunting lodge into a domesticate skatepark. 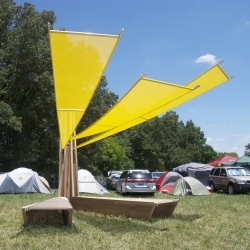 Bow Line, a sculpture created by Jason S. Brown, Christopher King, and Brian R. Jobe, is currently on view this weekend at Bonnaroo Music & Arts Festival 2012. 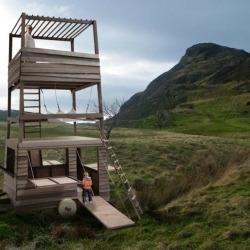 Located at Pod 7, the sculpture is a rest stop for festival attenders. 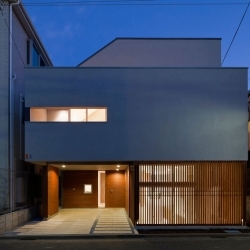 House in Setagaya-ku is a minimal home located in Tokyo, Japan, designed by Kashiwagi Sui Associates. 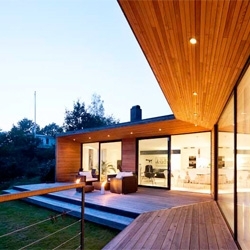 The home sits atop a 116.96 sq m site, and constructed mainly of wood. 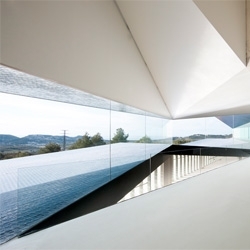 Stunning views at the Municipal Auditorium of Teluda by Francisco Mangado. 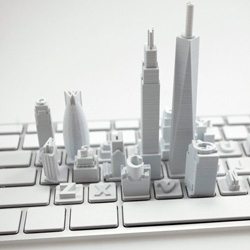 See how contemporary architects are harvesting the world's slums for design inspiration. 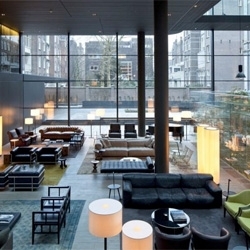 Amsterdam's Conservatorium Hotel by Piero Lissoni. 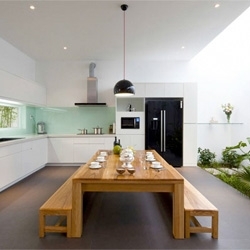 House in Go Vap by MM++ Architects in Ho Chi Minh City. 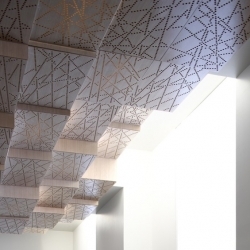 Press room of the French Ministry for Agriculture by H2O Architects. 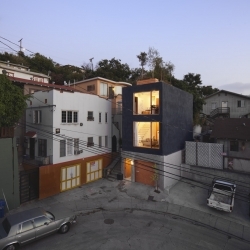 Eels Nest is a loft located in Los Angeles, CA designed by Anonymous Architects. The name comes from the Japanese translation of narrow lots that are within 3 to 15 meters in width. 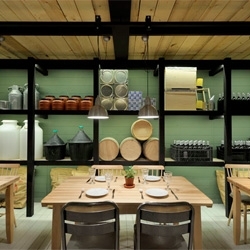 Restaurant Farma Kreaton (Meat Farm in Greek) with architecture and interior design of both spaces are by Minas Kosmidis. 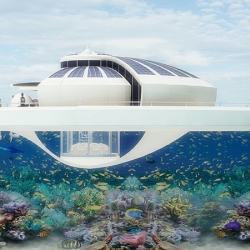 Solar Floating Resor by Michele Puzzolante with a thin-film solar skin applied to a lightweight balsa-reinforced fiberglass hull. 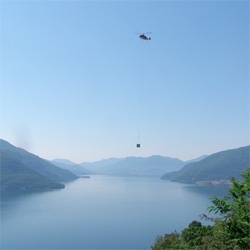 The round shape of the vessel provides constant exposure to the sun, feeding batteries during daylight hours. 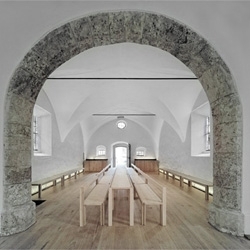 Hönshus-1 by Torsten Ottesjö, a stunning chicken coop! 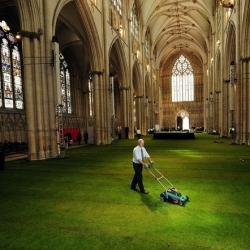 The nave of the 14th-century York Minster cathedral has been transformed by a 1,500 square meter 'living carpet' of grass on the occasion of the Queen's Jubilee.